Working to conserve our natural resources. The State Soil Conservation District has released clarifying information on the use the DelMarVa Unit Hydrograph. Please see Technical Bulletin 2018-4. The State Soil Conservation District has released Clarification and Guidance on the applicability of Soil Erosion and Sediment Control Program on land disturbance with approved NRCS conservation plans. ​The December 2018 meeting of the Camden County SCD Board of Supervisors has been cancelled. The December 17, 2018 meeting of the Camden County SCD Board of Supervisors has been cancelled. 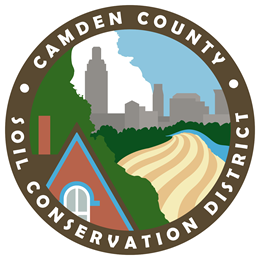 ​The mission of the Camden County Soil Conservation District is to conserve the natural resources for the citizens of Camden County, and be recognized leaders in resource conservation by providing technical assistance, conservation education, watershed planning and effective regulatory enforcement. ​Camden County SCD is fee-driven and is supported by the collection of plan review and project inspection fees paid by developers for construction projects. We receive no direct funding from Camden County or the State of New Jersey.